While the history of economic thought is generally begins with Adam Smith, the trail leads much further back in time. 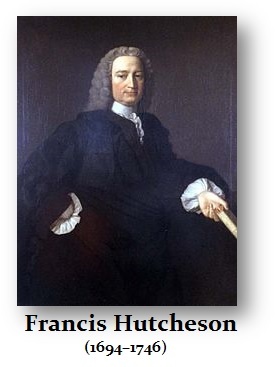 In 1742, Francis Hutcheson was a professor of Philosophy at the University of Glasgow. Hutcheson was the teacher of Adam Smith and most likely inspired his great quest to understand the economy of mankind. Hutcheson’s work was published in Latin under the title of Short Introduction to Moral Philosophy. This was followed five years later by an English translation, to which he was quite opposed. Book II of Hutcheson’s work is entitled “Elements of the Law of Nature.” It is here where we find a discussion of property, contracts, succession, war and the value of goods and of money (coin). These topics appear to be organized under the general section of philosophy quite separate from economics according to Hutcheson. From this ancient beginning, Adam Smith launched his monumental work “Wealth of Nations” which was perhaps the first attempt at turning the study of man’s economy into a science. Unfortunately, by the mid 19th century, Marx began to take economics away from the course of a science and into the realm of political philosophy. Thus, economics today as taught in most universities has transgressed from a science of observation and laws into a means of social philosophy by which the question is no longer observation and study but social manipulation to effect a desired end result. Consequently, the history of economic thought is one plagued by a battle between the science of economy and the philosophy of economy for social justice. It is important to understand that this battle between social justice and the study of the economy has resulted in economics becoming less of a science and more of a political tool to achieve a distinct purpose. This is the danger which must be recognized for impeding progress in what should otherwise be a science. Whenever political bias enters a science, that science is no longer legitimate but has been transformed into propaganda. Such was the case with astronomy when the politics of the world threatened prevent the idea that the sun was at the center of our system rather than the earth. For political reasons, they feared a change in such a system would disrupt the believe in heaven being above and hell being below. If there was noting above or below because the earth traveled around the sun rather than everything around a fixed earth, then the religious foundation would crumble and with it the political power base of the elite. Today, economics faces the same crisis between those who are interested in the study of what actually makes the economy tick and those who merely pretend to be economists as a means to enforce their personal political agenda of social justice. Such beliefs in social justice belong to philosophy and not to the science of economics. Until this debate is recognized for what it is, the socialists will continue to inhibit true observation and discovery as was the case with astronomy.